Charting folk singer and guitarist Tom Brosseau's path from North Dakota to Utah. On his website, Tom Brosseau touts himself as a "Highplainsman Troubadour." But you'll find nary a drop of hipster deceit in that descriptor. Born in Grand Forks, N.D., the 42-year-old grew up surrounded by music. His great-grandfather started a popular Peace Garden State band, Buck and the Buccaneers, which his grandparents and great-uncles performed in for decades. Across more than 10 of his own albums, Brosseau has paid particular attention to the memories and dreams that surround him, combining an astute writer's eye with a pure high tenor voice and a tender fingerpicking guitar style to become an icon in Americana circles. Revered back in his home state and celebrated around Los Angeles, where he lived and worked for 15 years with star bluegrass musicians like Chris Thile and Sean Watkins, Brosseau goes mostly incognito in his current Utah home. He moved here in 2016 with his wife, Lizzi, who grew up in Salt Lake City; their daughter, Johanna, arrived a year later. Although he toured the West Coast a little over the summer, Brousseau says he's cherished the quietude his new family has allowed him. His only local performances have come at what he calls "old folks' homes"—The Wentworth at Parklane in the Avenues and Sagewood at Daybreak in South Jordan. "Every once in a while, you have to regenerate by not going out on the road," he says. "I've mostly just been a stay-at-home parent this past year—and when I have a few hours in the evening or early in the morning, I've been working on two new projects." Those projects span both ends of Brosseau's far-reaching interests. One is a deep dive into the catalog of gospel legends the Carter Family, while the other is a solo album of original material informed by years spent exploring the idea of home, place and belonging. "One has fueled the other in a way," Brosseau says. "I'm a compulsive listener, and since the Carter Family recorded more than 300 songs, that well is boundless." Working with his long-time collaborator Sean Watkins—former member of Nickel Creek, brother to Americana superstar Sara, and organizer of Los Angeles' popular Watkins Family Hour—Brosseau has patiently mined obscurities from the main branch of the Carter Family, along with the lesser-known work of Joe and Janette Carter, who resisted the urge to move to Nashville with A.P., Sara and Maybelle and instead stayed home in Maces Spring, Va., to run the family store. "You can wade in the shallow area of the Carter Family for only so long before you want to go into the deep end," Brosseau laughs. "I'm not so much learning the songs as learning the story behind the songs: who wrote them, who's singing them, where they were recorded. The deeper I've gone, the more it's helped me wrap my head around my own writing." 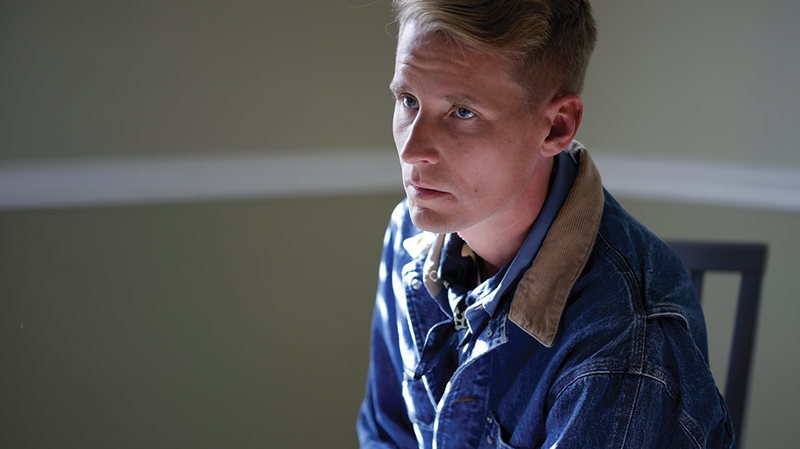 Brosseau's forthcoming solo record comes on the heels of his North Dakota trilogy, three albums released between 2014 and 2016 that visit "life from a local perspective, taking the listener on a journey that doesn't clip along uniformly on the same interstate but treads at its own pace on a rural route." But Brosseau believes his new work, which he's cultivating in conjunction with Minnesota upright bass player Gabriel Burkum, comes close to transcending his trademark specificity. Referencing the Netflix series Maniac and its creation of an alternate 1980s universe, he says, "Maybe I've thought about one location for so long now that I've pushed the identity out of it. It's become mythical—total myth. I'm writing and singing about traveling, and there's no point to any of it. It's a quick little peek through the window of a scene. It's man versus nature. It's almost like science fiction. I don't think it's good or bad, but I wonder how I got here." Musings like these endear Brosseau to listeners looking for a modern take on America's great folk tradition. He doesn't wear old-timey clothes or sport a lumberjack beard; he loves playing old guitars but insists on owning just one at a time: "As much as I have a fever for getting a guitar, I have the same fever for eventually letting it go." Instead, it's his thoughtfulness, his love of adventure and his ability to converse with you like you're the only person on the planet that makes Tom Brosseau feel like a throwback to an earlier era. "It's a healthy thing to go back, because you're paying attention to history," he says. "There's a lot you can learn from that." Sure, he offers lovingly hand-penciled lyric sheets as gifts. Yes, he prefers house shows to club dates. But at the end of the day, his unabashed passion for music and storytelling are impossible to ignore. Some have even called it naiveté—the Chicago Tribune once said, "With a voice so high and pure, [Brosseau] can't help but sound like a lost innocent being led off to the gallows"—but in our cynical world, we could use a little more of Brosseau's brand of curiosity and amazement. To wit: While patiently working on finishing his two current projects, he's slowly soaking up a 1952 Smithsonian Folkways album of Mormon folk songs. He recounts the Latter-day Saint story about the miracle of the gulls with eyes wide in wonderment, then relates a classic Ole and Lena joke from his Upper Midwest childhood. Yes, he's a Highplainsman Troubadour, albeit one on respite from the road. But as he reflects on the lessons he's learned as a touring musician, the fire in his eye is evident. "If it were up to me, I'd play a show every day," he says. "It's such a thrill. I love music so much. But music is such a small part of it. Really, I love people so much. What compels me to keep going is the place I've never been or the people I don't know. There's something neat about that. It's like a great adventure story, and I'm always up for an adventure."